Item Title: The title describes the merchandise for sale. It’s generally made up of keywords (rarely a complete sentence) that identify the item. Item Category: Located above the item, here’s a listing you can click if you want to do some comparison shopping. Current Bid: This field in an auction indicates the dollar amount the bidding has reached, which changes throughout the auction as people place bids. If no bids have been placed on the item, this field is called Starting Bid. Buy It Now: If you want the item immediately and the price quoted in this area is okay with you, click the Buy It Now link, which takes you to a page where you can complete your purchase. This is also an option in an auction listing. In this case, you can still place a bid for the lower bid price and the listing will convert to an auction format. Add to Cart: If you’re on a mini shopping spree and planning to buy a few items, click this box and the item will be added to your eBay shopping cart. Quantity: This field appears only in multiple item fixed-price sales. This is where you indicate how many of an item you wish to purchase. Next to the quantity, you will see how many are currently available and how many of the item have been sold. You can be sure that it’s a fixed-price sale because you have no opportunity to bid; you can just use the Buy It Now option (or Add to Cart) for whatever quantity of the item you desire. If a seller is selling two items for the price of one, the item quantity still shows up as 1 (as in 1 set of 2 bookends). Time Left: The official clock keeps ticking down as time passes. When the item gets down to the last hour of an auction, eBay automatically starts an interactive clock that counts the minutes and seconds. This field tells you the time remaining in this particular auction. Item Condition: All sellers must clearly state the condition of the item (or items) for sale. eBay varies the guidelines a seller may use in this area, depending on the category in which the item is listed. But rest assured that if an item is listed as new, it will be a brand-new, unused, unopened, undamaged item. Bids: This field (next to the Current or Starting bid) tells you how many bids have been placed on an auction. To use the number of bids to your advantage, you have to read between the lines. You can determine just how much attention this item has received by comparing the number of bids the item has received over time. Based on the amount of bids in an item, you can create a time strategy. If you want to see the starting bid, you have to click to see the bid history, by clicking the number of bids. By clicking there, you can also find out the number of individuals bidding and what date and time bids were placed. The dollar amount of each bid is shown in the bidding history, but bidders’ maximum bids are kept secret. 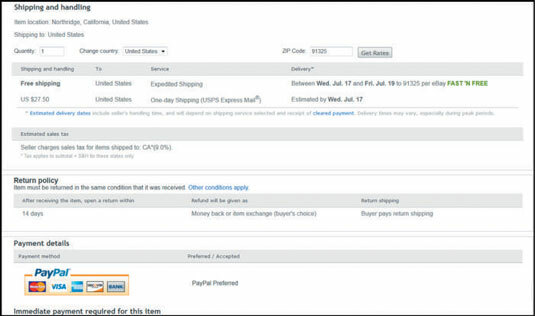 Shipping: This area gives you the shipping price to your location, The Item Location field tells you (at the very least) the country where the seller is located, and you may also see more specific info, such as the city and geographic area where the seller is. (What you see depends on how detailed the seller wants to be.) Also listed are the countries that the seller is willing to ship the item to. Add to Watch List: Click this link to magically add the item to the Watch section of your My eBay page. From there, you can keep an eye on the progress of the auction — without bidding. If you haven’t signed in, you have to type your User ID and password before you can save the auction to your My eBay page. Add to Collection: On the heels of the success of Pinterest, eBay has instituted a feature where you can build your own collections of favorite items and styles. Print: If you’d like to print a copy of the listing for reference, click here to get a complete printout of a listing. That way you get the entire description for your records. 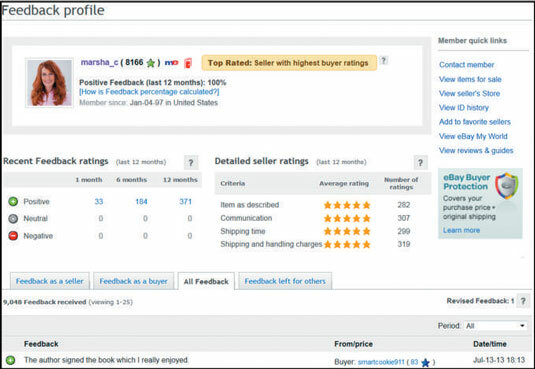 Seller Information: This area gives you links to the seller’s profile (by clicking the seller’s name) and to their feedback ratings (by clicking the number next to the seller’s ID). By clicking these links, you can get a better idea of your trading partner. The number next to the seller’s ID allows you to view his or her entire feedback history to make sure that you feel comfortable doing business with this person. Item Number: Just above the description area, you’ll find the item number on the far right. This number identifies the item within the eBay servers. Keep track of this info for later inquiries. Description tab: You see a tabbed bar consisting of two tabs. The opening (default) is the Description tab. The other tab is the Shipping and Payments tab. Be sure to scroll down the page and read the entire item description information carefully before bidding or buying. Shipping and Payments tab: Click this tab to see the details on shipping.